Die Jovis, videlicet, 14 die Julii. Lord Mayor to give his Answer about a Locum Tenens. Resolution of the Council of War to send Ships to Hull. E. of Salisbury disclaims having offered Horse at York. Warren, the Minister, versus the Parish of Walbrook. Elizabeth Hanford; versus her Husband. Message from the H. C. with an Order to prevent Soldiers being billeted at King's Lynn and Yarmouth. Lord Mayor's Answer about a Locum Tenens. Sir George Whitmore to call a Court of Aldermen, to choose one. Delinquents sent for, for insulting the Officers employed to raise Men for Hull. Impeachment of the Nine Lords who went to York. Message from the H. C. with an Answer to the King's Message. For the Messengers to acquaint the King about the Letter. and for the E. of Bedford to be General of the Horse. Order to certify His Majesty, that the House had framed their Petit on before the Receipt of His Majesty's Message. and to desire His Majesty to pass Three Bills which are with Him. E. of Bedford accepts the Command of the Horse. Ordered, (fn. 1) That Sir John Conyers, Lieutenant of The Tower, shall presently go to the Lord Mayor at The Tower, and receive his Answer to the Order of this House Yesterday, concerning the appointing of a Locum Tenens, for the governing of the City of London. A Letter was read, dated 13 July, from the Earl of Warwicke, with a Resolution of the Council of War, for sending Ships to the River of the Humber. (Here enter them). The Earl of Salishbury declared to this House, "That, whereas his Name is printed as One of those Lords who have offered Horse at Yorke, his Lordship did disclaim it, as a Falsity. Upon the Petition of Warren, a Minister; it is Ordered, That the Lord North, the Lord Hunsden, and the Lord Robartes, shall hear the Business between him and the Parish of Walbrooke, in London, on Saturday next, in the Afternoon, and to make Report thereof to the House; the Parties on both Sides to appear, and the Lord Chief Justice to assist the Lords. Ordered, That the King's last Message is referred to the Committee for the Defence of the Kingdom. That Eliz. Hanford is referred to take her Remedy at Law against her Husband; and the Petition in this House to be withdrawn. Ordered, That the Cause between Signor and Tanner is referred to the Examination of the Lord Chief Justice, who is to report the Business to this House. The House was adjourned during Pleasure into a Committee; and the Bill against Innovations was read and debated. "Whereas Information hath been given to the Parliament, of an Intention to billet great Companies of Soldiers in the Towns of Kinge's Lynne and Great Yarmouth, in the County of Norffolk, and also of an Intention to compel the Inhabitants there to receive them, by Colour of His Majesty's Authority, without Consent of both Houses in Parliament; the Doing whereof may be a great Terror to the Inhabitants there, and Disturbance to the Peace of the Kingdom, and is against the Petition of Right, the Law of the Land, and the Liberty of the Subjects: It is therefore Ordered, by the Lords and Commons in Parliament, That the Inhabitants of the said Towns of Kinge's Lyn and Great Yarmouth, in the County of Norff. aforesaid, or of any County, City, Town, or Place whatsoever, in this Kingdom, or Dominion of Wales, shall not be compelled to billet or receive any Soldiers, by any Authority whatsoever, without common Consent in Parliament: And it is further Ordered, by the said Lords and Commons, That, if any Force shall be used, to compel the said Inhabitants to receive or billet Soldiers without Consent of both Houses of Parliament, that then they may resist the same; and all Lords Lieutenants and their Deputies, Sheriffs, Justices of the Peace, Mayors, Bailiffs, Captains, Constables, and all other His Majesty's Officers and loving Subjects, are hereby required to be aiding and assisting to the said Inhabitants in so doing." The Lieutenant of The Tower returned this Answer of the Lord Mayor: "That he hath no Power to appoint a Deputy, for the Government of the City of London, during his Absence." Ordered, by the Lords in Parliament, "That, in regard the Lord Mayor of London is restrained of his Liberty, that Sir George Whitmore, Knight and Alderman, do cause a Court of Aldermen to be summoned, to meet at Guildhall, To-morrow in the Afternoon; and the Aldermen so summoned are strictly required to appear accordingly, and then to make Choice of a Locum Tenens, or to consider of what other Way will be according to the Customs or Charters of the City, for the Safety and good Government thereof; and to give Account of their Proceedings therein to the said Lords in Parliament, on the 16th of this Instant July, at Ten of the Clock in the Forenoon." The House being informed, "That the Captains that were appointed to levy Voluntiers for Hull, have been abused in the Streets, and One Man is apprehended, who, is conceived, was set on by others:" Hereupon it is Ordered, That the said Person shall be brought before the Committee for the Safety of the Kingdom this Afternoon, at Two a Clock. Ordered, That the Impeachment of the Nine Lords shall be proceeded in To-morrow Morning, the First Cause; and the Lords to have Notice to be present. To let the House of Commons know, that this House intends to sit this Afternoon, at Five a Clock; and to desire their House to sit likewise, if it may stand with their Conveniency. 1. They, having considered the King's Message, do desire that the Messengers that carry the Petition to the King may present this Answer to the Message, from both Houses. Ordered, That this House will take the Proclamation that was sent with this Message into Consideration hereafter. 2. To desire to concur in an Order to the Messengers, to acquaint the King about His Letter. 3. An Order to the Messengers, to desire the King to pass Three Bills which are with Him. 4. To desire their Lordships Concurrence, and to approve of the Earl of Bedford to be General of the Horse; and that he be recommended to the Earl of Essex, to be appointed by him for that Place. That this House agrees with the House of Commons, to recommend the Earl of Bedford to the Earl of Essex, to be General of the Horse. The Earl of Essex presently approved of the Earl of Bedford to be the General of the Horse, according to the Recommendations of both Houses. Ordered, That the rest of this Report shall be made in the Afternoon. That this House agrees with them in the Three Orders which are to be sent to the Messengers that go to the King: Concerning the rest of the Message, this House will send them an Answer, by Messengers of their own. 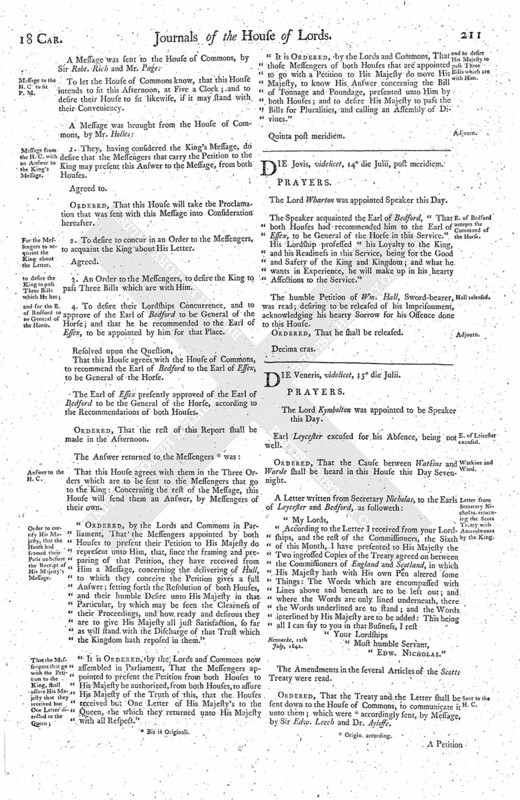 "Ordered, by the Lords and Commons in Parliament, That the Messengers appointed by both Houses to present their Petition to His Majesty do represent unto Him, that, since the framing and preparing of that Petition, they have received from Him a Message, concerning the delivering of Hull, to which they conceive the Petition gives a full Answer; setting forth the Resolution of both Houses, and their humble Desire unto His Majesty in that Particular, by which may be seen the Clearness of their Proceedings, and how ready and desirous they are to give His Majesty all just Satisfaction, so far as will stand with the Discharge of that Trust which the Kingdom hath reposed in them." 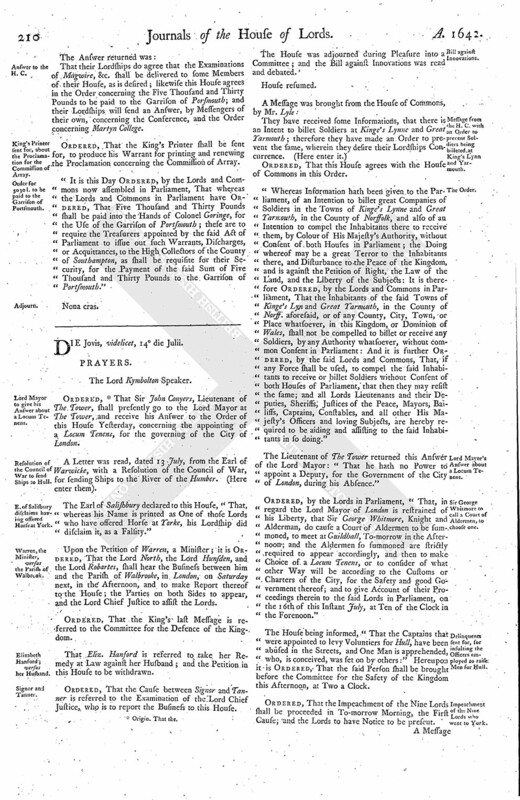 "It is Ordered, by the Lords and Commons now assembled in Parliament, That the Messengers appointed to present the Petition from both Houses to His Majesty be authorized, from both Houses, to assure His Majesty of the Truth of this, that the Houses received but One Letter of His Majesty's to the Queen, the which they returned unto His Majesty with all Respect." "It is Ordered, by the Lords and Commons, That those Messengers of both Houses that are appointed to go with a Petition to His Majesty do move His Majesty, to know His Answer concerning the Bill of Tonnage and Poundage, presented unto Him by both Houses; and to desire His Majesty to pass the Bills for Pluralities, and calling an Assembly of Divines." The Lord Wharton was appointed Speaker this Day. The Speaker acquainted the Earl of Bedford, "That both Houses had recommended him to the Earl of Essex, to be General of the Horse in this Service." His Lordship professed "his Loyalty to the King, and his Readiness in this Service, being for the Good and Safety of the King and Kingdom; and what he wants in Experience, he will make up in his hearty Affections to the Service." The humble Petition of Wm. Hall, Sword-bearer, was read; desiring to be released of his Imprisonment, acknowledging his hearty Sorrow for his Offence done to this House. Ordered, That he shall be released.